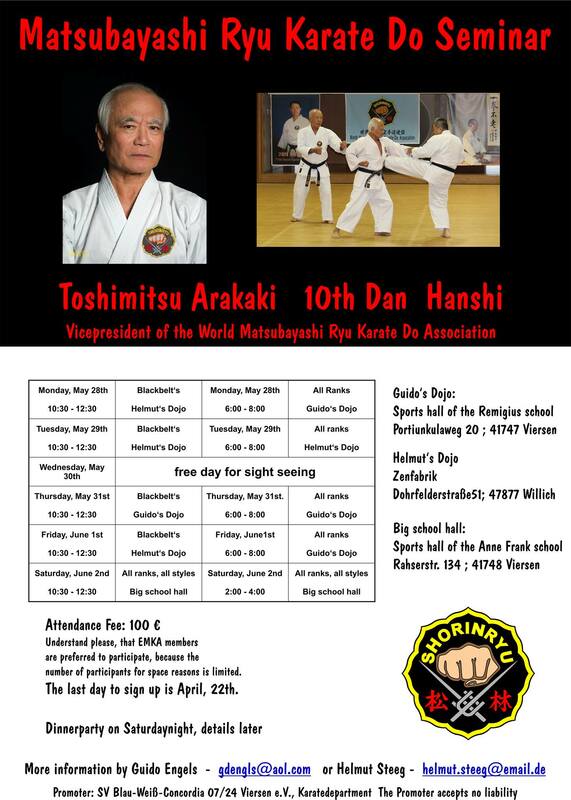 The European taikai will this year be in Madrid, hosted by Ricardo Camani Kyoshi. More information will follow, but mark the dates. Location:Viersen, Germany. For details including schedule, see the flyer in German. Additional dates for EMKA/WMKA members: Monday May 28 to Friday June 1. Location:Viersen and Willich, Germany. For details including schedule, see the flyer in English or in German. Check back for information about future seminars. Please find the seminar flyer here. Please find the seminar schedule here. Please find the seminar invitation here. The EMKA plans to attend with a large group, and asks all dojos and members to start planning their participation. Everyone who attended the last world seminar in 2010 knows this is an event not to be missed! Location:Viersen, Germany. For details including schedule, see the flyer in English and in German. Additional dates for EMKA/WMKA members: Monday August 31 to Friday Sep. 5. Location:Eastbourne, East Sussex, England. For details including schedule, see the flyer in English. 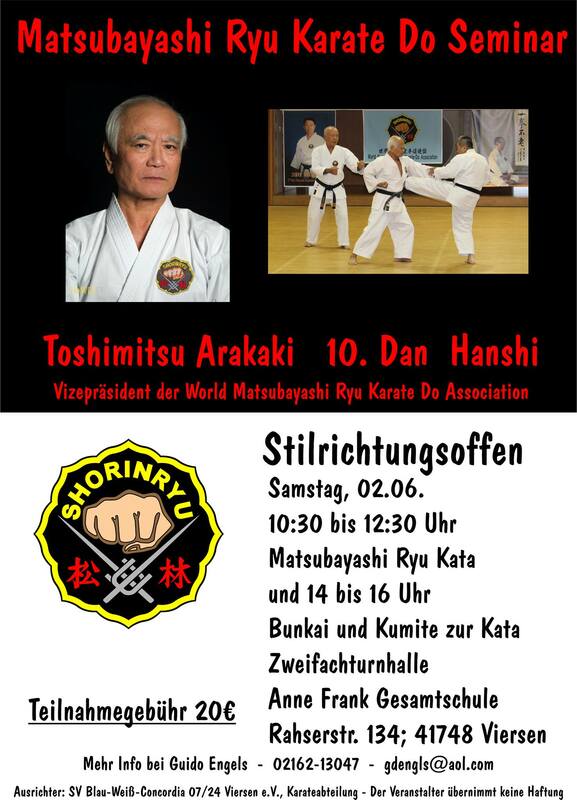 Location:Kodokan Anrode Karate Dojo, Willich Anrath, Germany. Seminar fees: between 5 € for juniors and 20 € for seniors, depending on class attendance. Flyer for the seminar in German. Location:White Tiger Martial Arts, Castlebar, Ireland. Seminar fees: 15 € for juniors, 25 € for seniors. Saturday 27: White Tiger Martial Arts, Castlebar, Co. Mayo. Seminar fees: 20 € for juniors, 30 € for seniors. Flyer for the seminar in English and German. Flyer for the seminar in English. Seminar fees: 30 € for juniors, 35 € for seniors. To celebrate the 20th anniversary of BSI Karate, 15 years of Matsubayashi-ryu in Norway and 60 years since the inauguration of the Nagamine Dojo in Naha, Okinawa. Evening classes Thursday and Friday. Two classes Saturday and Sunday. Seminar fees: 25 € for juniors, 30 € for seniors. Flyer for the seminar (in German) here. Location: White Tiger Martial Arts, Castlebar, Co. Mayo. Information, including accomodation, in the seminar flyer. The full seminar flyer in English. Flyer for the open seminar (in German). We have received a full report of the seminar with pictures. A big thank you to Senseis Martin O'Malley and Guido Engels for text and photos. Open grade session 11 – 12.30. Please find more information about the seminar, fees, travel, accomodation, etc in the seminar flyer. The flyer will probably make you want to use the opportunity to take a few days holiday in the area! Renshi Ole-Bjørn Tuftedal in Timmel, Germany, Saturday February 26. 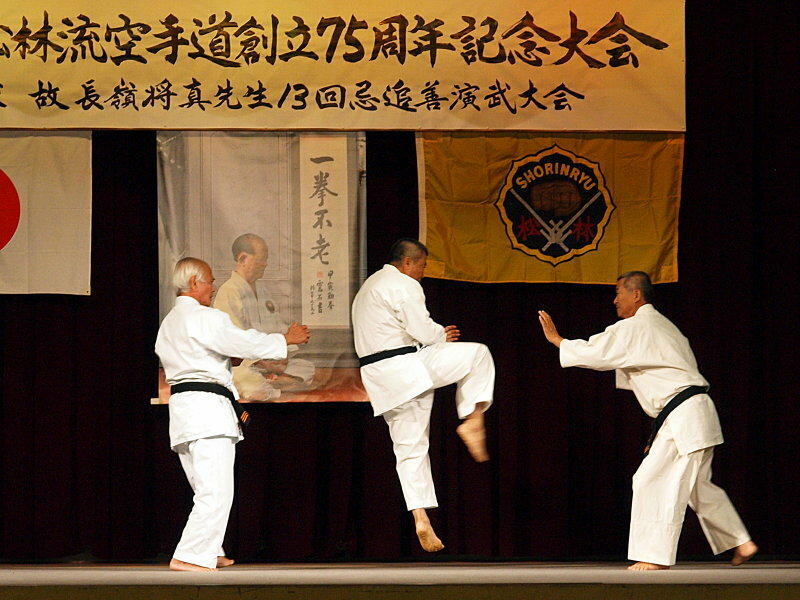 How and why traditional Okinawan karate is different from sports karate. Kihon, kata, self defence and close range fighting - and how it's all related. The seminar will be in Timmel, in North West Germany, by the coast some 100 km from Bremen. Flyer (in German) here. Seminar fee: Children and teens: 10 €, adults 20 €. Adults: 13 - 18 PM. Matsubayashi-ryu students may also train with Renshi Tuftedal on Sunday 27 from 10 AM to 15 PM. 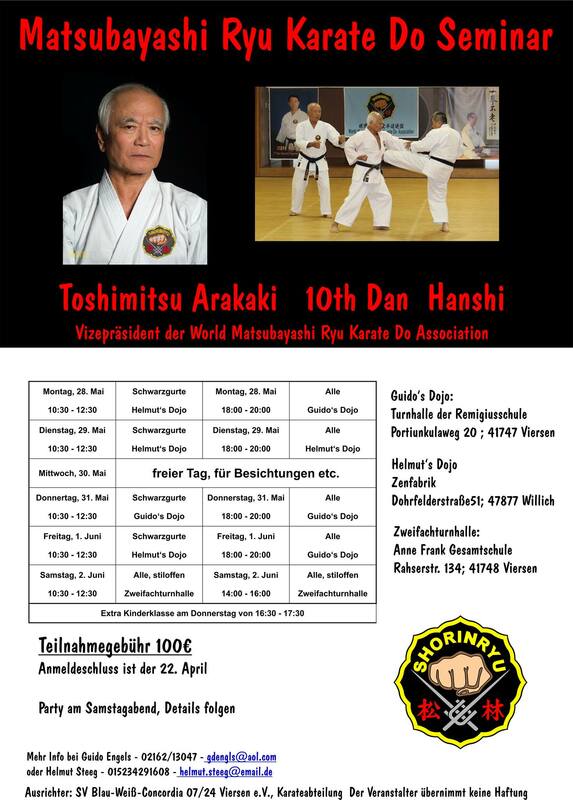 Renshi Ole-Bjørn Tuftedal in Hannover, Germany March 1 and 4. Theme: Self defence and close range fighting. Saturday 17th in White Tiger Martial Arts, Castlebar, Co. Mayo. Flyer here. There is a B&B in the village where we will be training, to book call +353 9490 32235 and ask for Phillip or Geraldine Gormley. Location: Saint Vincent de Tyrosse, in the south west of France, not far from the Spanish border. Seminar fee: 70 € for all classes, 20 € per day. The full seminar flyer (in French). Ole-Bjørn Tuftedal Sensei in Ireland January 29 and 30. The seminar will cover kihon, kata and kumite, and will be in Castlebar, Co. Mayo. Flyer here. The full seminar flyer (in German). Soke Nagamine in Ireland July 31 to August 2nd. Friday 31 in Elphin, Co. Roscommon. Flyer here. Saturday 1 st and Sunday 2nd in Castlebar, Co. Mayo. Flyer here. Soke Nagamine in France July 22 - 25 in Saint Vincent de Tyrosse. The location is in the south west of France, not far from the Spanish border. Ole-Bjørn Tuftedal Sensei in Germany December 11 to 13 in Willich. The seminar will be in Willich, near Düsseldorf. Flyer (in German) here. Ole-Bjørn Tuftedal Sensei in Germany March 6 in Hannover. Theme: Self defence and close range fighting - how and why traditional Okinawan karate is different. Thank you very much for a warm welcome and a very inspiring atmosphere! 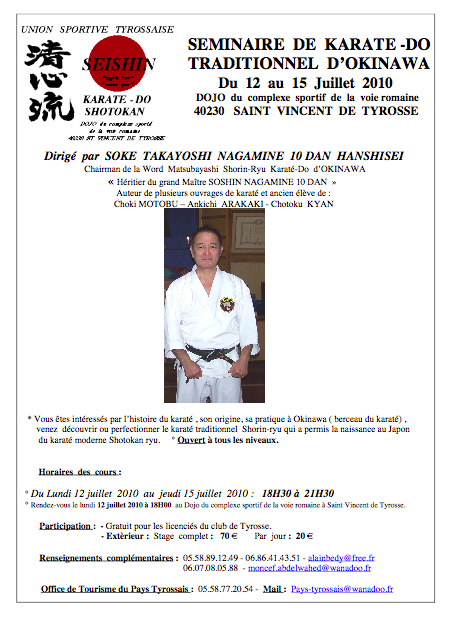 Soke Nagamine in France May 23 and 24 in Saint Vincent de Tyrosse. Seminar fee for all classes: 35 €. Soke Nagamine in Bergen, Norway from May 26 to June 1, 2008. At this time of the year, Bergen is at it's best. There are several music and cultural festivals: A jazz festival Nattjazz and Bergen International Festival, a general cultural festival with music, theatre, ballet, literature, cinema etc.